I Buy Way Too Many Records Dot Com: Scaries - Missing You 7"
Quite a while ago, my buddy Jim was downsizing his record collection and before he made the trip to the used record store, he had me take a look through it to see if there was anything that I needed. As luck would have it, there were a few things I wanted, one of which was this Scaries 7" that I never had. 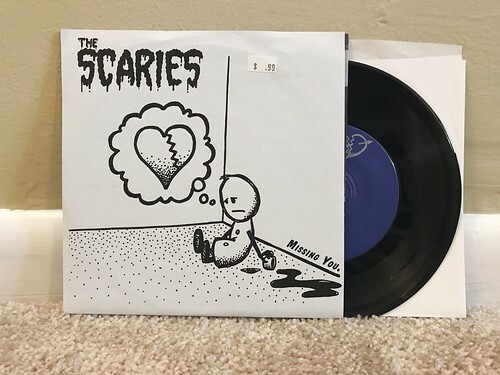 As I had written about previously on this website, I had picked up the Scaries record Over You back when it came out and then traded it to a friend in Japan who was helping me hunt down some Snuffy Smile records I was chasing. After I traded it away, thinking I could easily replace it since I was in America, it was nearly fifteen years before I was able to track down another copy. I wasn't expecting that, but at least it was able to work out in the end. I mention that album as two of the four songs on this 7" also appear on the Over You full length, "Anymore" and "Never Fade Away." A third song, "Disappear" also appears on another Scaries full length called Wishing One Last Time. The only song exclusive to this 7" is the title track "Missing You" and it's a hell of a song. Fast and punchy like Superchunk mixed with Walker (I have made this comparison before, but it really captures the sound I think), stutter stop palm muting in all the right places and a big anthemic chorus. Everything I wanted in 1997 and to be honest, it's what I still look for in 2018. Sadly a band that is probably somewhat forgotten (except in Japan for whatever reason), but one that should be in ever respectable pop punk collection.